American test pilot astronaut 1966-1986. Status: Deceased; Active 1966-1986. Born: 1936-10-11. Died: 2013-08-21. Spaceflights: 2 . Total time in space: 15.95 days. Birth Place: Rochester, New York. Born October 11, 1936, in Rochester, New York. Bachelor and master of science in mechanical engineering from California Institute of Technology. Flew Space Shuttle approach and landing tests 1, 3 and 5; STS-3 and STS 51-F. 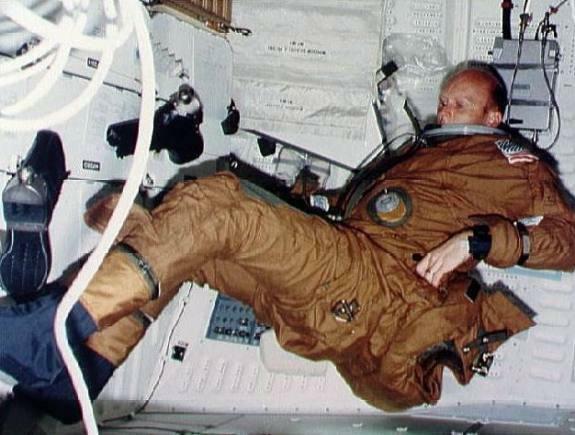 Cumulative hours of space flight are more than 382. Colonel, U.S. Air Force (Retired) Born in New York. Died in Lancaster, California. On August 21, 2013, C. Gordon Fullerton passed away due to complications from a stroke. In December 2007, Fullerton retired from NASA and his post of Associate Director of Flight Operations at NASA's Dryden Flight Research Center, Edwards, California. His assignments included a variety of flight research and support activities piloting the 747 Shuttle Carrier Aircraft (SCA) and other multi-engine and high performance aircraft. 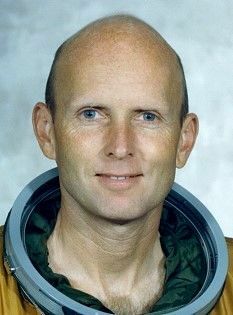 Fullerton, who logged 382 hours in space flight, was a NASA astronaut from September 1969 until November 1986 when he joined the Flight Crew Branch at Dryden. In July 1988, he completed a 30-year career with the U.S. Air Force and retired in the rank of colonel. As the project pilot on the NASA B-52 launch aircraft, Fullerton flew during the first six air launches of the commercially developed Pegasus space vehicle. He was involved in a series of development air launches of the X-38 Crew Recovery Vehicle and in the Pegasus launches for the X-43A Hyper-X advanced propulsion project. Fullerton had been involved in numerous other research programs at Dryden. He was the project pilot on the Propulsion Controlled Aircraft program, during which he successfully landed both a modified F-15 and an MD-11 transport with all control surfaces neutralized, using only engine thrust modulation for control. Fullerton also flew Dryden�s DC-8 Airborne Science aircraft, regularly deployed worldwide to support a variety of research studies, including atmospheric physics, ground mapping and meteorology. Assigned to evaluate the flying qualities of the Russian Tu-144 supersonic transport during two flights in 1998, he reached a speed of Mach 2 and became one of only two non-Russian pilots to fly that aircraft. He led a project that utilized a Convair 990 modified to test space shuttle landing gear components during many very high-speed landings. Other projects for which he had flown in the past included the C-140 JetStar Laminar Flow Control; F-111 Mission Adaptive Wing; F-14 Variable Sweep Flow Transition; Space Shuttle drag chute and F-111 crew module parachute tests with the B-52; X-29 vortex flow control; and the F-18 Systems Research Aircraft. With more than 16,000 hours of flying time, Fullerton piloted 135 different types of aircraft, including full qualification in the T-33, T-34, T-37, T-38, T-39, F-86, F-101, F-104, F-106, F-111, F-14, F-15, F/A-18, X-29, KC-135, C-140, B-47, T-38, B-52, B-747, G-1159 and T-34C. Fullerton graduated from U.S. Grant High School, Portland, Oregon. He earned a Bachelor of Science and Master of Science in Mechanical Engineering from the California Institute of Technology, Pasadena, California, in 1957 and l958, respectively. Fullerton entered the U. S. Air Force in July 1958 after working as a mechanical design engineer in the Flight Test Department of Hughes Aircraft Co., Culver City, California. After flight school, he was trained as an F-86 interceptor pilot and later became a B-47 bomber pilot at Davis-Monthan Air Force Base, Tucson, Arizona. In 1964, he was selected to attend the Air Force Aerospace Research Pilot School (now the Air Force Test Pilot School), Edwards Air Force Base, California. Upon graduation he was assigned as a test pilot with the Bomber Operations Division at Wright-Patterson Air Force Base, Dayton, Ohio. Fullerton served as a flight crew member for the Air Force Manned Orbiting Laboratory program from 1966 through 1969. After assignment as an astronaut to the NASA Johnson Space Center, Houston, Texas, Fullerton served on the support crews for the Apollo 14, 15, 16, and 17 lunar missions. In 1977, Fullerton was assigned to one of the two flight crews that piloted the space shuttle prototype Enterprise during the Approach and Landing Test Program at Dryden. Fullerton was the pilot on the eight-day STS-3 space shuttle orbital flight test mission from March 22 to 30, 1982. The mission exposed the orbiter Columbia to extremes in thermal stress and tested the 50-foot Remote Manipulator System used to grapple and maneuver payloads in orbit. STS-3 landed at White Sands, New Mexico, because Rogers Dry Lake at Edwards was wet due to heavy seasonal rains. Fullerton was commander of the STS-51F Spacelab 2 mission launched on July 29, 1985. This mission, with the orbiter Challenger, was the first pallet-only Spacelab mission and the first to operate the Spacelab Instrument Pointing System (IPS). It carried 13 major experiments in the fields of astronomy, solar physics, ionospheric science, life science and materiel science (a super fluid helium experiment). The mission ended August 6, 1985, with a landing at Dryden. Among the special awards and honors Fullerton received are the Iven C. Kincheloe Award from the Society of Experimental Test Pilots in 1978; Department of Defense Distinguished Service and Superior Service Medals; Air Force Distinguished Flying Cross; NASA Distinguished and Exceptional Service Medals; NASA Space Flight Medals in 1983 and 1985; General Thomas D. White Space Trophy; Haley Space Flight Award from the American Institute of Aeronautics and Astronautics; American Astronautical Society Flight Achievement Awards for 1977, 1981 and 1985; the Certificate of Achievement Award from the Soaring Society of America and the Ray E. Tenhoff Award from the Society of Experimental Test Pilots in 1992 and 1993. Fullerton was inducted into the Astronaut Hall of Fame in 2005 and the International Space Hall of Fame in 1982. He was a Fellow of the Society of Experimental Test Pilots; member of Tau Beta Pi, an engineering honorary fraternity; honorary member of the National World War II Glider Pilot Association and a Fellow of the American Astronautical Society. This is the only version available from NASA. Updates must be sought direct from the above named individual�s family. C. Gordon Fullerton is a research pilot at NASA's Dryden Flight Research Center, Edwards, Calif. His assignments include a variety of flight research and support activities piloting NASA's B-52 launch aircraft, the 747 Shuttle Carrier Aircraft (SCA), and other multi-engine and high performance aircraft. 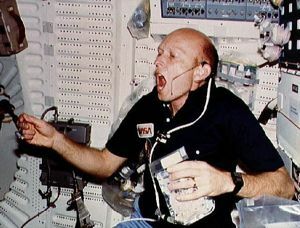 Fullerton, who logged more than 380 hours in space flight, was a NASA astronaut from September 1969 until November 1986 when he joined the research pilot office at Dryden. In July 1988, he completed a 30-year career with the U.S. Air Force and retired as a Colonel. He continues in his position of research pilot as a civilian. Fullerton was project pilot on the NASA/Convair 990 aircraft which has been modified as a Landing Systems Research Aircraft to test space shuttle landing gear components. He is also the project pilot on the F-18 Systems Research Aircraft, a testbed to develop new flight control actuators, fiber optic control systems, and other advanced aircraft technology. As project pilot on the B-52 launch aircraft, Fullerton was involved in six air launches of the commercially developed Pegasus space vehicle. Fullerton is the project pilot on the Propulsion Controlled Aircraft program, and has successfully landed both a modified F-15 and an MD-11 transport with all control surfaces fixed, using only engine thrust modulation for control. In addition to these current activities, Fullerton has been project pilot on a number of other research programs at Dryden. Among them are the C-140 Jetstar Laminar Flow Control; F-111 Mission Adaptive Wing; F-14 Variable Sweep Flow Transition; Space Shuttle drag chute and F-111 crew module parachute tests with the B-52; and X-29 vortex flow control. With over 13,800 hours of flying time, Fullerton has piloted 115 different types of aircraft, including full qualification in the T-33, T-34, T-37, T-38, T-39, F-86, F-101, F-104, F-106, F-111, F-14, F-15, F-18, X-29, KC-135, C-140, B-47, B-52 and DC-8. Since joining Dryden as a research pilot, Fullerton has piloted nearly all the research and support aircraft flown at the facility and currently flies the F-18, B-52, the NASA/Convair 990, and the 747 Shuttle Carrier Aircraft. Born Oct. 11, 1936, in Rochester, N. Y., Fullerton graduated from U.S. Grant High School, Portland, Ore. He received Bachelor of Science and Master of Science degrees in Mechanical Engineering from the California Institute of Technology, Pasadena, Calif., in 1957 and l958, respectively. Fullerton entered the U. S. Air Force in July 1958 after working as a mechanical design engineer for Hughes Aircraft Co., Culver City, Calif.
After primary and basic flight school, he was trained as an F-86 interceptor pilot, and later became a B-47 bomber pilot at Davis-Monthan AFB, Ariz. In 1964 he was chosen to attend the Air Force Aerospace Research Pilot School (now the Air Force Test Pilot School), Edwards AFB, Calif. Upon graduation he was assigned as a test pilot with the Bomber Operations Division at Wright-Patterson AFB, Ohio. In 1966 Fullerton was selected for and served as a flight crew member for the Air Force Manned Orbiting Laboratory program until its termination in 1969. After assignment to the NASA Johnson Space Center, as an astronaut Fullerton served on the support crews for the Apollo 14, 15, 16, and 17 lunar missions. In 1977, Fullerton was assigned to one of the two two-man flight crews which piloted the Space Shuttle prototype Enterprise during the Approach and Landing Test Program at Dryden that same year. Fullerton was the pilot on the eight-day STS-3 Space Shuttle orbital flight test mission Mar. 22-30, 1982. Launched from the Kennedy Space Center, Fla., the mission exposed the orbiter Columbia to extremes in thermal stress and tested the 50-foot Remote Manipulator System used to grapple and maneuver payloads in orbit. STS-3 landed at Northrup Strip, White Sands, N.Mex. because Rogers Dry Lake at Edwards AFB was wet due to heavy seasonal rains. Fullerton was commander of the STS-51F Spacelab 2 mission, launched from the Kennedy Space Center, Fla., on July 29, 1985. 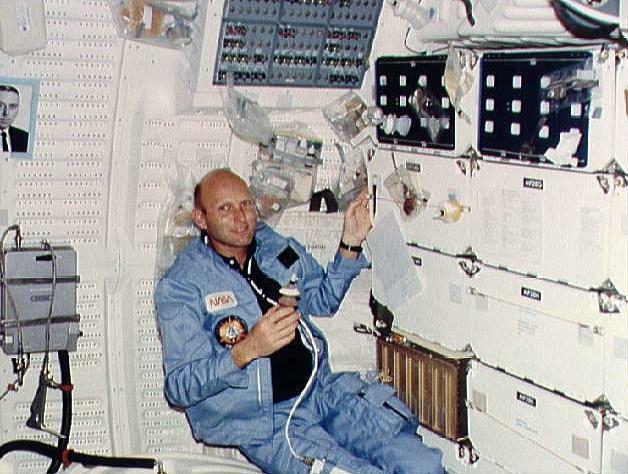 This mission, with the orbiter Challenger, was the first pallet-only Spacelab mission and the first to operate the Spacelab Instrument Pointing System (IPS). It carried 13 major experiments in the fields of astronomy, solar physics, ionospheric science, life science, and a super fluid helium experiment. The mission ended August 6, 1985, with a landing at Dryden. Among the special awards and honors Fullerton has received are the Iven C. Kincheloe Award from the Society of Experimental Test Pilots in 1978; Department of Defense Distinguished Service and Superior Service Medals; Air Force Distinguished Flying Cross; NASA Distinguished and Exceptional Service Medals; NASA Space Flight Medals in 1983 and 1985; General Thomas D. White Space Trophy; Haley Space Flight Award from the American Institute of Aeronautics and Astronautics; American Astronautical Society Flight Achievement Awards for 1977, 1981, and 1985; the Certificate of Achievement Award from the Soaring Society of America, and the Ray E. Tenhoff Award from the Society of Experimental Test Pilots in 1992 and 1993. Fullerton, inducted into the International Space Hall of Fame in 1982, is a Fellow of the Society of Experimental Test Pilots; member, Tau Beta Pi; honorary member of the National World War II Glider Pilot Association; and a Fellow of the American Astronautical Society. Departed: October 1986. Departed Date: 1986-10-01. Marital Status: Married. Children: Two children. Education: Caltech;Edwards. Family: Astronaut. Country: USA. Flights: STS-3, STS-51-F. Projects: STS. Agency: USAF. Bibliography: 459, 5409. 1936 October 11 - . Birth of Charles Gordon Fullerton - . Nation: USA. Related Persons: Fullerton. American test pilot astronaut 1966-1986. 2 spaceflights, 16.0 days in space. Flew to orbit on STS-3 (1982), STS-51F..
1977 June 18 - . Launch Site: Edwards. Launch Complex: Edwards. LV Family: Shuttle. Launch Vehicle: Space Shuttle. Enterprise flight 1 - . Call Sign: Enterprise. Crew: Fullerton, Haise. Nation: USA. Related Persons: Fullerton, Haise. Program: STS. Class: Manned. Type: Manned spaceplane. Spacecraft Bus: Shuttle. Spacecraft: Enterprise. First manned captive active flight. Enterprise (OV-101)/shuttle carrier aircraft, Edwards (55 minutes, 46 seconds). 1977 July 26 - . Launch Site: Edwards. Launch Complex: Edwards. LV Family: Shuttle. Launch Vehicle: Space Shuttle. Enterprise flight 3 - . Call Sign: Enterprise. Crew: Fullerton, Haise. Nation: USA. Related Persons: Fullerton, Haise. Program: STS. Class: Manned. Type: Manned spaceplane. Spacecraft Bus: Shuttle. Spacecraft: Enterprise. Third manned captive active flight. Enterprise (OV-101)/shuttle carrier aircraft, Edwards (59 minutes, 50 seconds). 1977 August 12 - . Launch Site: Edwards. Launch Complex: Edwards. LV Family: Shuttle. Launch Vehicle: Space Shuttle. Enterprise flight 4. The space shuttle made its first free flight. - . Call Sign: Enterprise. Crew: Fullerton, Haise. Nation: USA. Related Persons: Fullerton, Haise. Program: STS. Class: Manned. Type: Manned spaceplane. Spacecraft Bus: Shuttle. Spacecraft: Enterprise. 1977 September 23 - . Launch Site: Edwards. Launch Complex: Edwards. LV Family: Shuttle. Launch Vehicle: Space Shuttle. Enterprise flight 6 - . Call Sign: Enterprise. Crew: Fullerton, Haise. Nation: USA. Related Persons: Fullerton, Haise. Program: STS. Class: Manned. Type: Manned spaceplane. Spacecraft Bus: Shuttle. Spacecraft: Enterprise. Third free flight , ALT, tail cone on, Edwards (5 minutes, 34 seconds), Enterprise (OV-101), lake bed Runway 15. 1977 October 26 - . Launch Site: Edwards. Launch Complex: Edwards. LV Family: Shuttle. Launch Vehicle: Space Shuttle. Enterprise flight 8 - . Call Sign: Enterprise. Crew: Fullerton, Haise. Nation: USA. Related Persons: Fullerton, Haise. Program: STS. Class: Manned. Type: Manned spaceplane. Spacecraft Bus: Shuttle. Spacecraft: Enterprise. Fifth free flight, ALT, final tail cone off, Edwards (2 minutes, 1 second), Enterprise (OV-101), concrete Runway 04. STS-3 - . Call Sign: Columbia. Crew: Fullerton, Lousma. Payload: Columbia F03 / OSS-1. Mass: 10,301 kg (22,709 lb). Nation: USA. Related Persons: Fullerton, Lousma. Agency: NASA Houston. Program: STS. Class: Manned. Type: Manned spaceplane. Flight: STS-3. Spacecraft Bus: Shuttle. Spacecraft: Columbia. Duration: 8.00 days. Decay Date: 1982-03-30 . USAF Sat Cat: 13106 . 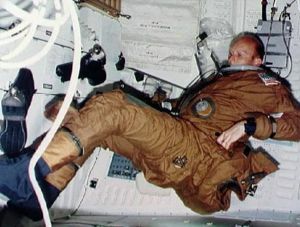 COSPAR: 1982-022A. Apogee: 249 km (154 mi). Perigee: 241 km (149 mi). Inclination: 38.00 deg. Period: 89.40 min. Manned two crew. Payloads: Office of Space Science (OSS) experiments, Monodisperse Latex Reactor (MLR), Electro-phoresis Verification Test (EEVT), Plant Lignification Experiment..
1982 March 30 - . Landing of STS-3 - . Return Crew: Fullerton, Lousma. Nation: USA. Related Persons: Fullerton, Lousma. Program: STS. Flight: STS-3. First and only landing by a shuttle at White Sands, New Mexico, after weather at Edwards did not permit landing there. STS-3 landed at 16:04 GMT..
STS-51-F - . Call Sign: Challenger. Crew: Acton, Bartoe, Bridges, England, Fullerton, Henize, Musgrave. Payload: Challenger F08 / PDP / Spacelab 2 PLT. Mass: 15,603 kg (34,398 lb). Nation: USA. Related Persons: Acton, Bartoe, Bridges, England, Fullerton, Henize, Musgrave. Agency: NASA Houston. Program: STS. Class: Manned. Type: Manned spaceplane. Flight: STS-51-F. Spacecraft Bus: Shuttle. Spacecraft: Challenger. Duration: 7.95 days. Decay Date: 1985-08-06 . USAF Sat Cat: 15925 . COSPAR: 1985-063A. Apogee: 337 km (209 mi). Perigee: 203 km (126 mi). Inclination: 49.50 deg. Period: 89.90 min. Manned seven crew. At 5 minutes, 45 seconds into ascent the number one engine shut down prematurely due to a a sensor problem and an abort to orbit was declared. Despite the anomaly the mission continued. Launched PDP; carried Spacelab 2. Payloads: Spacelab-2 with 13 experiments, Shuttle Amateur Radio Experiment (SAREX), Protein Crystal Growth (PCG). The flight crew was divided into a red and blue team. Each team worked 12-hour shifts for 24-hour-a-day operation. 1985 August 6 - . Landing of STS-51-F - . Return Crew: Acton, Bartoe, Bridges, England, Fullerton, Henize, Musgrave. Nation: USA. Related Persons: Acton, Bartoe, Bridges, England, Fullerton, Henize, Musgrave. Program: Spacelab. Flight: STS-51-F. STS-51-F landed at 19:52 GMT. .
2013 August 21 - . Death of Charles Gordon Fullerton. - . Related Persons: Fullerton. American test pilot astronaut 1966-1986. 2 spaceflights, 16.0 days in space. Flew to orbit on STS-3 (1982), STS-51F..